164 players returned from dinner break. 29 of them left the tournament area in the next 40 minutes. The Legend of the Food Coma strikes again. 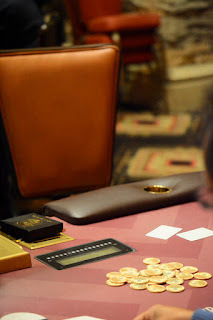 Legend has it that between 15-20 percent of the returning field departs in the first 40 minutes after dinner break in poker tournaments across the country. Among the Post dinner break departures is Rep Porter, Scott Ball, Kathy Stahl and Lance Donnell.